(Itasca, Illinois) The Itasca, Illinois based firm of Williams Architects recently announced a strategic sponsorship with the National Association of Park Foundations (NAPF). 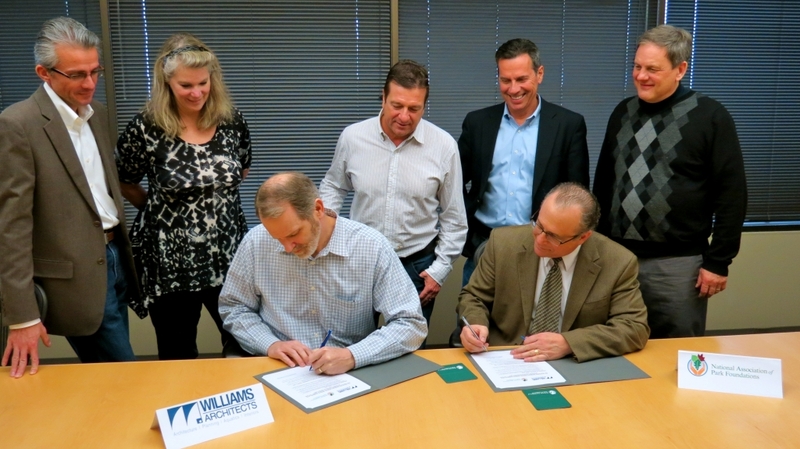 The multi-year sponsorship agreement further exemplifies the commitment of Williams Architects to support the parks and recreation local park foundation sector through the ongoing corporate social responsibility initiatives of Williams Architects. (From left to right) Williams Architects representatives Frank Parisi, Karen Lellios, Tom Poulos, Tom LaLonde, Steve Mihelich, Mark Bushhouse (seated) and Donald Ortale (seated), National Association of Park Foundations.